A retainer fee is an upfront fee paid by a client for the professional services of an advisor, consultantFinancial Modeling Consultant, lawyer, freelancer, etc. The fee is usually associated with attorneys are hired to provide legal servicesAudit Legal ImplicationsInaccurate or erroneous financial information cause audit legal implications. Auditors are responsible for making sure that all line items on financial statements are presented fairly. The audit reports ultimately affect the business decisions of banks, government, investors, and other business-related entities.. This fee is used to guarantee the commitment of the service provider but does not usually represent all the fees for the entire process. Additionally, a retainer fee does not ensure a successful final output. Once the payer and receiver have agreed on the work to be performed, the retainer fee is sometimes deposited in a different account than the account of the receiver to ensure that the funds are not used for other purposes. Once a client has engaged an attorney to represent him or her in a case, the client is sometimes required to deposit an upfront retainer fee. The attorney should provide a retainer agreement detailing the retainer fee and how to proceed if the fee is depleted. If a lawyer charges $200 per hour and the parties estimate that the case will take a minimum of 30 hours, the client may be required to deposit a $6,000 retainer fee. The attorney will then invoice the client at the end of the month, and transfer the fee from the special account into his account. If the case takes more work than is covered by the retainer, the attorney will bill the client for more. However, if the case takes less time than the initial estimate, the attorney will refund the client the excess amount. The majority of bar associations prohibit attorneys from charging a retainer fee that represents more hours than a case is likely to require. Clients maintain the right to end legal representation whenever they want during the contract if he/she is unhappy with the attorney. Once the agreement is terminated, the client may claim the balance of the retainer fee after paying the attorney an amount equivalent to the number of hours worked. Therefore, clients should clarify with the attorney if they notice a “non-refundable” clause regarding retainer fees in the agreement. Once a client signs a representation agreement with an attorney stipulating the retainer fee, the client is required to deposit the fee in a special account. Any time the attorney works on the case, he keeps track of the hours spent and invoices the client at the end of the month. For example, the attorney may project that he will spend 10 hours, at an hourly rate of $100, amounting to a $1,000 retainer fee. If in the first month the lawyer spends four hours on the case, he will charge $400 against the $1,000 retainer fee, leaving a balance of $600. If the attorney completes the case in the second month after spending another three hours, he will charge $300 against the remaining fee, leaving a balance of $300. The billing also includes the time spent making phone calls, sending faxes, and preparing records. If all pending issues have been addressed and there is no extra fee, the client gets a refund of the remaining $300. After the retainer fee is depleted, the attorney may bill the client in several ways. The first option is to enter into a contingency fee agreement with the client. 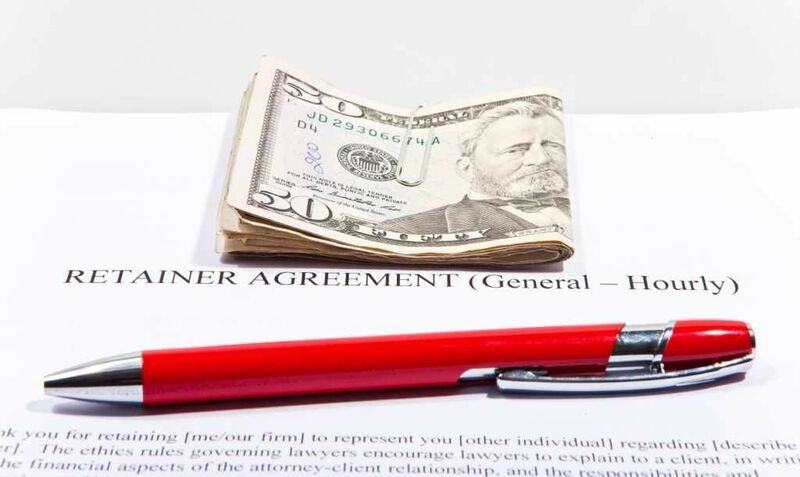 A contingency fee agreement provides that the lawyer does not get paid unless he wins the case. If the case ends in favor of the client, the attorney takes a percentage of the amount awarded by the court. Such an option mainly applies in tort and personal injury cases where the client demands a settlement from the other party. The client and attorney must first agree about the payment plan in advance and put it in writing. If the client needs an attorney for a long-term relationship, the client may engage the attorney on a retainer basis. The retainer is usually a fixed amount that the client commits to pay the attorney on a monthly basis in exchange for the opportunity to engage him in the future when legal issues come up. Such agreements are common among businesses such as tech companies, restaurants, and hospitals that may be threatened with a legal suit by one of their customers. Hiring a lawyer on a retainer basis is usually a cheaper option than hiring an in-house attorney. An unearned retainer fee refers to the amount of money deposited in a retainer account before the commencement of work. The amount serves as a guarantee by the client to pay the attorney upon completion of the agreed work. The attorney cannot claim the retainer fee until he has completed the work and invoiced the client. Any remaining retainer fee after paying the hourly attorney fees should be returned to the client. Earned retainer fee refers to the amount that is transferred from the special account to the attorney’s operating account after completing an agreed task. The amount that the lawyer will receive per hour is usually agreed upon before the commencement of the work and indicated on the retainer fee agreement. The earned retainer fee is paid every month until the case is closed. Sometimes, the lawyer may be paid according to the milestones he has completed, for example, 25% after the pre-trial process, 60% after the hearing, and 100% when the case is determined and closed. A retainer fee compensates the attorney for his expertise and reputation. When hiring an attorney, clients choose an attorney with a good reputation in the legal profession to help them win a case. Choosing the right attorney can sometimes help the client obtain a settlement without even going to court. Also, the retainer fee aims to protect the attorney from unforeseen circumstances in the future that can prevent clients from meeting their obligations. Once the case has started, the attorney can charge any costs against the retainer fee instead of asking the client to provide extra funds. If an unexpected event occurs during the court process that prevents the client from being able to pay out any more money, the attorney can receive some compensation for the work performed through having received the retainer fee. Thank you for reading CFI’s guide to retainer fee. For further information, we offer the following resources, as well as the official Financial Modeling & Valuation AnalystFMVA™ CertificationThe Financial Modeling & Valueation Analyst (FMVA)™ accreditation is a global standard for financial analysts that covers finance, accounting, financial modeling, valuation, budgeting, forecasting, presentations, and strategy. certification program.